TAOS, a new American independent feature film directed by Seattle native Brandon Schmid, will screen at the Santa Fe Film Festival on December 4th at 3:30pm at the Scottish Rite Theater -- DO NOT MISS this one-time screening event in Santa Fe. TAOS tells the story of a young professional who recovers a lost sense of place and purpose when faced with the unexpected loss of his father and an accidental breakdown in the northern New Mexican desert. TAOS is a powerful personal journey about dealing with unexpected loss and the choices we face every day in finding balance for ourselves in relation to our families, our work and our personal interests. 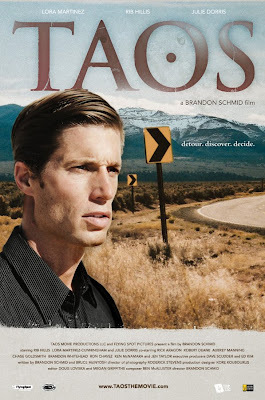 TAOS was written, directed and produced by Brandon Schmid through Taos Movie Productions LLC and Flying Spot Pictures. The film stars Rib Hillis, Lora Martinez-Cunningham, and Julie Dorris, with strong supporting roles performed by Rick Aragon, Robert Deane, Robert Lowell, Ed Zajac, Aubrey Manning, and Jen Taylor. Filmed on location in Taos, New Mexico and Seattle, Washington, the story for the film takes place primarily in Taos and the scenes shot on-location highlight the natural beauty of the region. “TAOS is an impressive feature which represents the finest efforts by New Mexico filmmakers to produce an independent project of a high caliber and I love the film,” says Stephen Rubin, Program Director of the Santa Fe Film Festival.